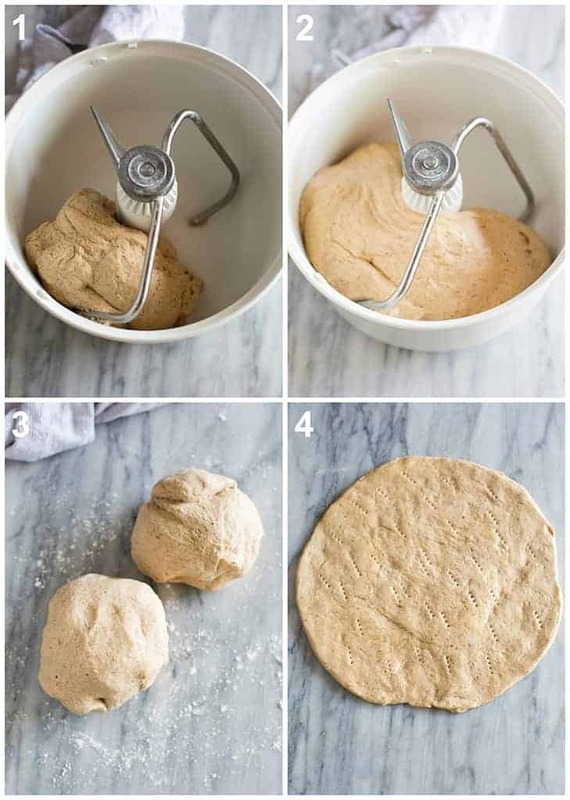 A step-by-step guide for making Wheat Pizza Dough. 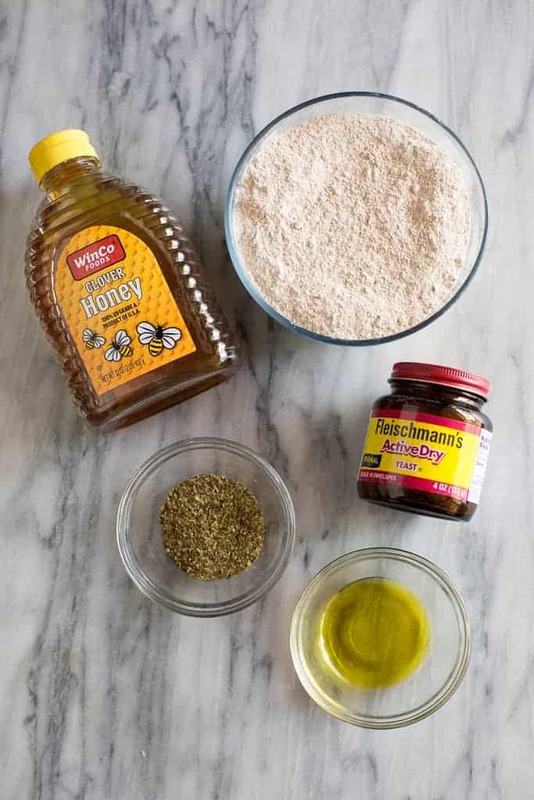 This pizza dough recipe is quick, easy, and healthier than traditional pizza crust! Not only does this wheat pizza dough make a healthy pizza crust, it’s also super flavorful. 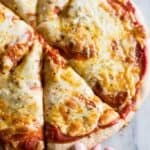 Top it with anything you like, including my favorite 5-minute pizza sauce, and don’t miss my all of my favorite Pizza Recipes. After searching and searching for a good Wheat Pizza Dough recipe it was quite simple to adapt elements from a few different ones to make my own! 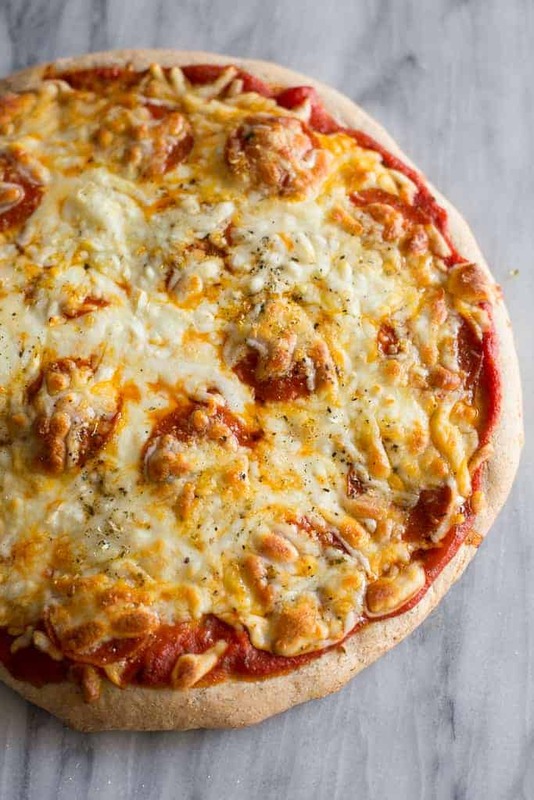 This pizza dough is the ultimate healthy pizza crust recipe that still tastes just as good as a regular pizza crust (unlike cauliflower pizza crust, for example). I use a combination of half white flour and half whole-wheat flour because I’ve found that the crust rises better and is more soft and chewy, rather than dense. Add the olive oil and salt and stir to combine. Add the whole wheat flour and 1 cup of the all-purpose flour. Mix until the dough starts to come together. Knead with your stand mixer (or on your greased counter with your hands) for 7-10 minutes or until the dough is smooth and elastic. Add more flour, if needed. The dough should be slightly sticky to the touch, but not so sticky that it sticks to your finger. Place dough in an oiled bowl, and turn to coat the surface. Cover and allow to rise until doubled in size, about 1 hour. When the dough has doubled, divide it into 2-3 balls depending on how thin or thick you want your crust to be. I usually make three medium size, thinner crust pizzas, but you could make two larger pizzas. Spray your work surface lightly with cooking spray, or dust lightly with flour. Use a rolling pin or your hands to roll and stretch the dough to your desired pizza size. Prick all over with a fork. Pre-bake pizza crust at 450 degrees in a pizza pan or on a pizza stone, for 6 minutes. Remove the crust and add pizza sauce and toppings. Bake for about 8-10 more minutes or until the cheese is melted and bubbly. Pro Tip: Before pre-baking my pizza crust, I heat the oven with a pizza stone inside. If you don’t have a pizza stone you could use a baking tray (like a cookie sheet), turned upside down. I then sprinkle cornmeal on my pizza peel and place the crust on top, and then slide the crust onto the hot baking stone. If you don’t have a pizza peel you can place the pizza crust on a piece of parchment paper to lift and set it onto your hot pizza stone or baking tray. I’ve found that the key to making homemade pizza dough is pre-baking your pizza dough. It’s absolutely essential to pre-bake the dough for 5-6 minutes before adding pizza sauce and toppings. The result is a crust that holds on its own and is slightly crisp on the outside, and soft and chewy on the inside. 2. Give the pizza dough sufficient time to rise! For best results in texture, be sure to give the dough time to properly rise. It’s common practice to roll pizza dough on a floured surface, but I actually like to spray my counter with non-stick spray instead of using flour. That way excess flour doesn’t make the dough tough and its really easy to stretch the dough with your hands. You can also use a rolling pin to roll the dough into a circle, or your desired shape but I find that using my hands is just as easy. If you want to be a true Italian pizza artist, check out this tutorial on how to stretch your pizza dough by tossing the dough in the air. This pizza dough recipe makes enough for two regular crusts or three thin crust pizzas. You can freeze any leftover pizza dough that you don’t use. Form a ball with the dough and lightly spray it on all sides. Wrap it in plastic wrap and place it in a ziplock freezer bag in the freezer for up to 3 months. To thaw, place the pizza dough in the refrigerator overnight to to thaw and rise. Once risen, roll it out when you are ready to pre-bake. You could also pre-bake the pizza crust and freeze the pre-baked crust before adding sauce and toppings. Just make sure the crust cools completely and then wrap it in plastic wrap and tinfoil and store it in your freezer. A step by step guide for making Wheat Pizza Dough. 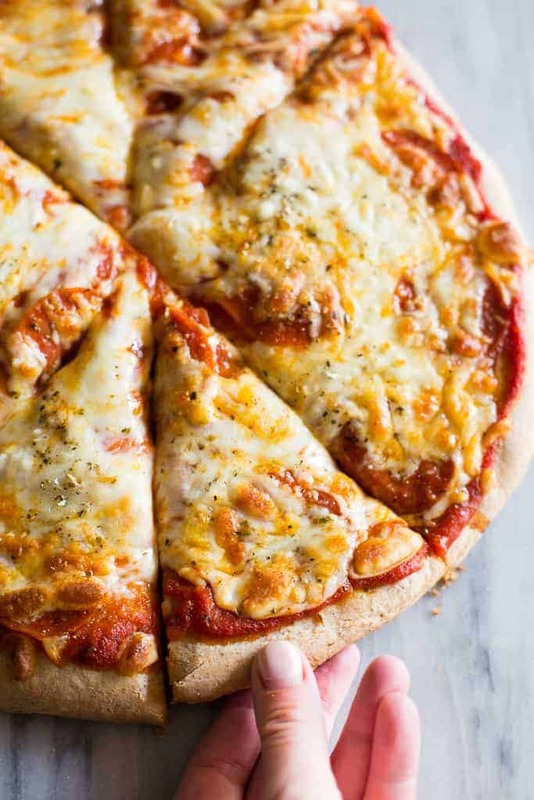 This pizza dough recipe is quick, easy, and healthier than traditional pizza crust! Add the olive oil and salt and stir to combine. Add the whole wheat flour and 1 cup of the all-purpose flour. Mix until the dough starts to come together. Knead with your stand mixer (or on your greased counter with your hands) for 7-10 minutes or until the dough is smooth and elastic. Add more flour, if needed. The dough should be slightly sticky to the touch, but not so sticky that it sticks to your finger. Option 1: Make the dough up until the first rise. Place the dough in an airtight container in the fridge to rise overnight, or for several hours, before rolling it out and pre-baking it. Option 2: Completely make the pizza dough, including pre-baking it in the oven for 6 minutes. Top with desired pizza toppings, cover well with plastic wrap and refrigerate for several hours, until ready to bake your pizza. Find instructions for freezing pizza dough, above in the post. *I originally shared this recipe August 2010. Updated March 2019. What size do you normally make with this size batch? Have you ever frozen the dough and/or the partially baked crust? Hi Rick, I usually make two 12-15inch pizzas with it. You can freeze the dough before the first rising. Then take it out of the freezer in the morning and let it thaw and rise throughout the day. I don’t normally need to pre-bake this crust since it’s already so thin. But if you want it crispier you could pre-bake it at 450 degrees F for 5-6 minutes, then add your toppings and finish baking! I wanted to make a slightly healthier pizza dough and found this recipe. I was shocked at how flavorful it was and how much the crust tastes just as good (actually better) than my oldd pizza dough recipe. Will be using this one from now on! I’m so happy to hear that Amy! Thanks for your comment.